The number of single-family homes built-for-rent in the US increased over the course of 2018, as construction starts of this type of housing totaled 43,000 homes, compared to 37,000 for 2017. There were 10,000 single-family built-for-rent starts for 4Q 2018. According to data from the Census Bureau’s Quarterly Starts and Completions by Purpose and Design and NAHB analysis, the market share of single-family homes built-for-rent, as measured on a one-year moving average, stood at 4.9% of single-family starts as of 4Q 2018. Given the small size of the market segment, the quarter-to-quarter movements are not typically statistically significant. The current market share remains higher than the recent historical average of 2.7% (1992-2012) but is down from the 5.8% reading registered at the start of 2013. This class of single-family construction excludes homes that are sold to another party for rental purposes. It only includes homes built and held for rental purposes. 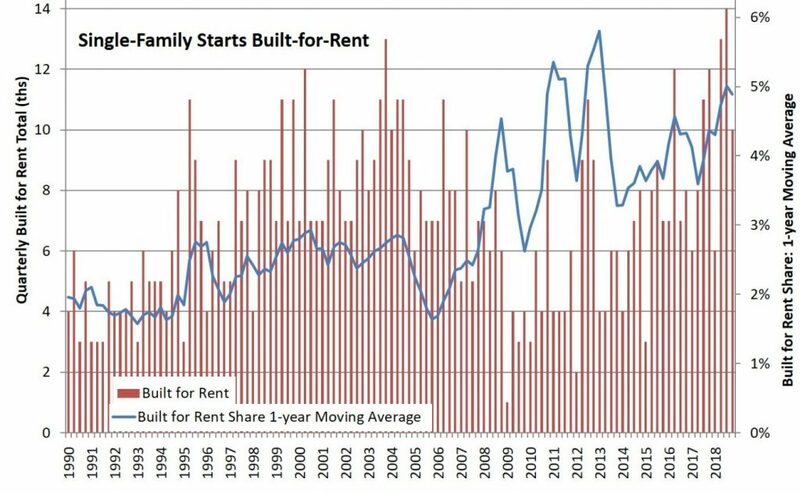 An elevated rental share of multifamily construction is holding typical apartment size below levels seen during the pre-Great Recession period. As multifamily developers in the US build more for-sale housing units in the years ahead, the average size of multifamily homes is likely to rise. 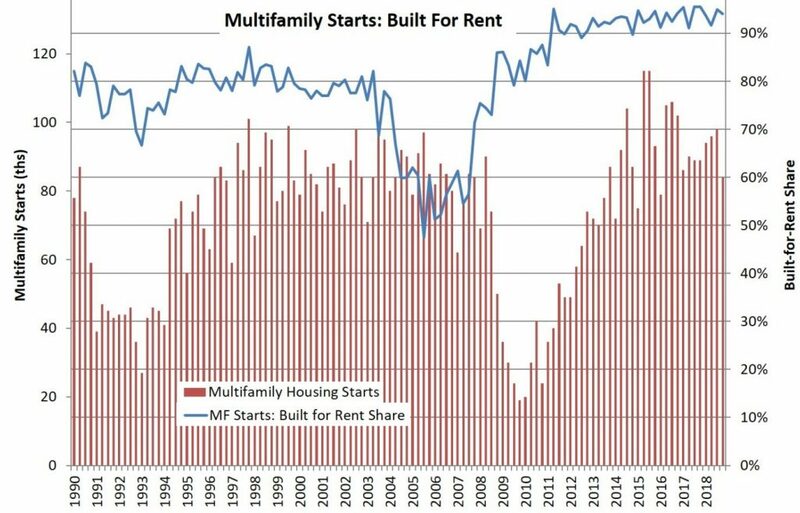 The market share of rental multifamily construction starts ticked down to 94% during 4Q 2018. In contrast, the historical low share of 47% was set during the third quarter of 2005, during the condo building boom. The average share of 80% was registered during the 1980-2002 period. There were only 24,000 multifamily condo units that started construction over the last year, just slightly higher compared to 2017 (20,000).